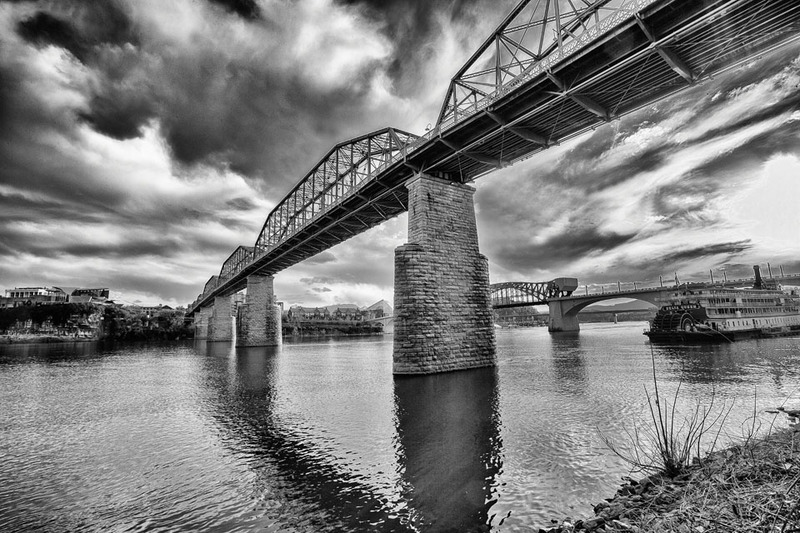 Chattanooga is a restless city. For 150 years, “the Dynamo of Dixie” has surprised America with its innovations in industry and technology. Lately, the city’s pioneering initiatives in Internet access have suggested a new and startling identity for the old place, suggesting a new brand that might have baffled Chattanoogans just a generation ago: Gig City. Framed by its dramatic setting, on one of the sharpest turns of the Tennessee River, and at the foot of distinctively anvil-shaped Lookout Mountain, Chattanooga has never been just one city. It carries multiple identities. The picturesque city may be known to the world, to begin with, as the site of one of the Civil War’s most dramatic and consequential battles. After Chattanooga, which was several battles in one, the end of America’s costliest war was just a matter of time. 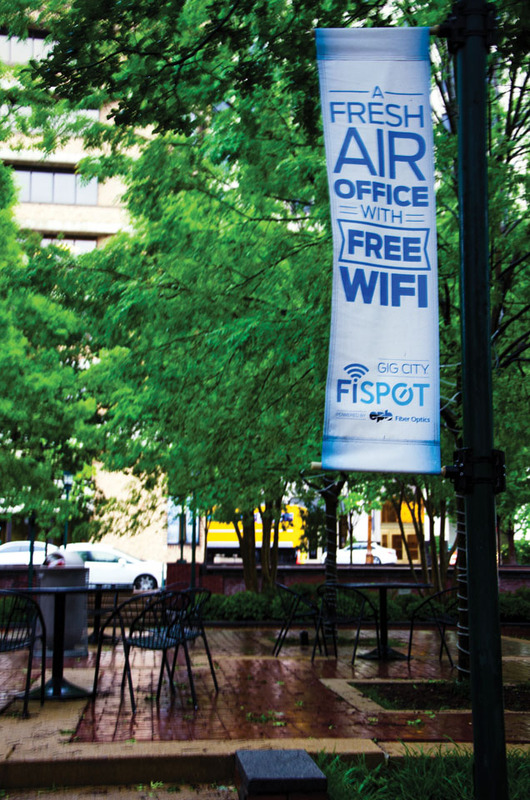 ▲ A banner beckons downtown professionals and creatives out of the office and into Miller Plaza, where the Electric Power Board offers free high-speed wireless Internet to park goers. 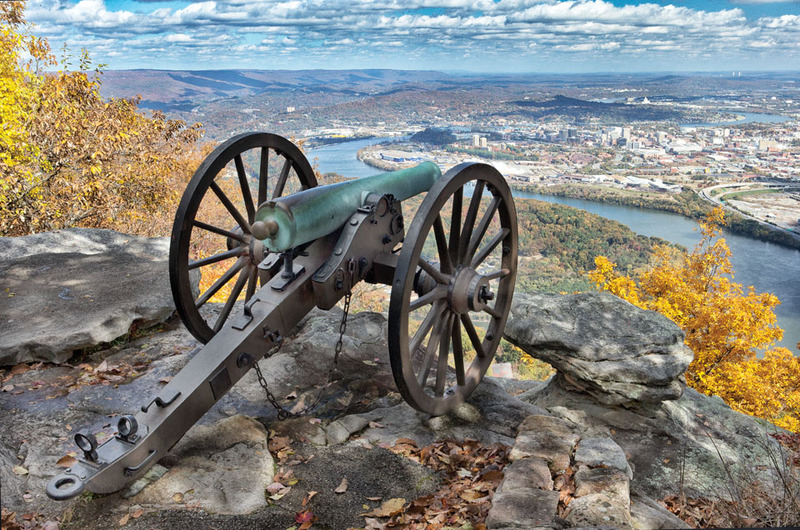 At the same time, tens of thousands of Americans, both families and scholars visited the city every year to stand on famous Missionary Ridge, or Orchard Knob, or way up on dramatic Lookout Mountain, and try to picture the complicated strategies that resulted in a decisive and significant Union victory. They also came for the city’s picturesque geography and breathtaking views, used to striking effect by extraordinary attractions like Ruby Falls and Rock City. Few cities are more associated with family vacations than Chattanooga. It became known as The Scenic City. Then it became its own opposite. The city’s burgeoning industry brought money and jobs and problems. The city’s growth and economic success came at a major cost, Chattanooga was known as one of America’s most polluted cities. By the late 1960s, this smoky urban hollow became known to uncharitable and inelegant critics as the Armpit of the South. And then, of course, there’s that Song. Americans of a certain age may also recall a certain radio hit, a boogie-woogie dance number, all about a train called the “Chattanooga Choo-Choo.” It still rattles around in the mind of millions of Americans who were born after it peaked on the charts. It left its name on one of the city’s best-known downtown attractions. ▲ A view of downtown Chattanooga and the Bluff View Arts District from the Tennessee River. Spanning 2,376 feet, the Walnut Street Bridge above is one of the longest pedestrian bridges in the world. In more recent years, it has still newer name, one which seems fit for the shorthand of the texts and tweets of a new century: Gig City. It doesn’t imply anything about frog hunting or rock ‘n’ roll road shows. Gig, in a reborn Chattanooga’s parlance, is short for Gigabits. 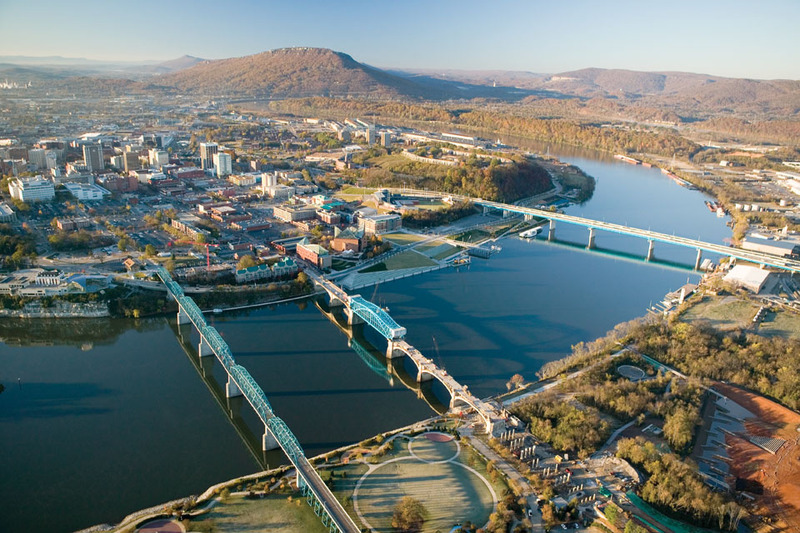 Chattanooga is the Western Hemisphere’s first city to provide ten gigabit-per-second Internet service to all its residents and businesses. That’s hundreds of times faster than what’s available in most cities in America. The advantage suggests enormous potential for the city’s technological future. It’s catching on. “Your Gig is Here,” as one motto has it. GIGTANK 365 is a startup accelerator for boosting local tech businesses by making the best of the city’s extraordinary digital advantage, emphasizing fields ranging from 3D printing to health care. Leading the way in finding applications for Chattanooga’s Gig era is a remarkable trio of innovators who were extremely successful young businessmen before they founded an organization several civic leaders believe is already changing the city. It’s called the Lamp Post Group. Three former college roommates, Ted Alling, Barry Large, and Allan Davis, young men who grew up with the Internet, had used their tech savvy to build a perhaps unprecedented transportation logistics firm, used their earnings to push Chattanooga—and, in some respects, the world—forward into a new era of rapid communication, calculation, and innovation. Chattanooga is once again proving its facility for solving tough problems with creative thinking and a boldness about pushing forward with new ideas. That civic habit has deep roots.